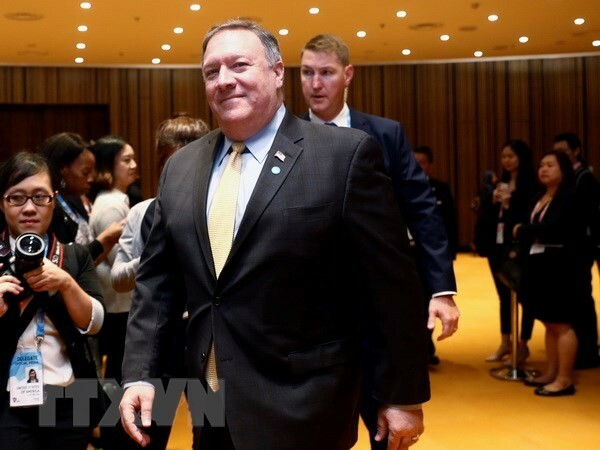 (VOVWORLD) - Secretary of State Mike Pompeo says the renewed sanctions against Iran are an important pillar in US policy toward Tehran. Mr. Pompeo says the sanctions will be rigorously enforced and remain in place until the Iranian government radically changes course. He told reporters on his way home from a three-nation trip to South East Asia, that the Trump administration is open to looking beyond sanctions, but added that would "require enormous change" from Tehran. US sanctions had been eased by the Obama administration under the terms of the landmark 2015 Iran nuclear deal. President Trump decided in May to withdraw from the accord.